...whoa... I love a woman on her tiptoes. That's nonsense talk, Tom, because this is damned pretty. The hair. The arch of the back. The kind of Yin and Yang effect you get with the smoking guns. There's a ton of cool stuff going on with this.And she's nekkid under that coat! What more could anyone ask for? Nice job. 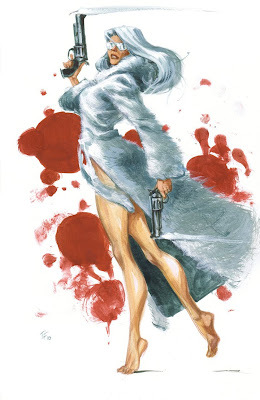 Love the texture of the coloring especially on her legs, her fur, and the smoke emanating from her guns.